In Technical Tip #19, I described the impending move to 36Volt power systems. 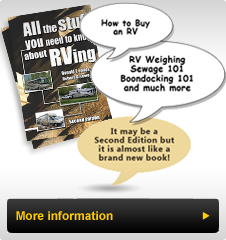 The ability to return the engine to the primary function of moving the coach should bring joy to all motorhome owners. More of the engine power will arrive at the rear wheels and that will not only move the coach much more efficiently, it will improve acceleration and fuel economy. Most of the power wasting accessories can (and will) be powered by highly efficient, light weight electric motors, located as part of an assembly at the point of use rather than in the engine compartment. Imagine an electrically powered, computer controlled coolant pump that continues to circulate coolant throughout the engine after the coach is stopped, reducing engine temperatures to a safe level. This would greatly increase the life of the engine and ultimately lead to engines that are lighter, since thermal expansion stresses will be greatly reduced. Fleetwood air conditioning (A/C) systems on our present Bounders contain an engine powered compressor and cooling lines that can be as long as 70 feet on rear engine, diesel powered rig. With the introduction of 36V systems, the A/C unit could be integrated as a complete unit and installed close to the front of the coach, possibly in a cabinet for simple service. Ultimately Bounders could contain a single roof air and cab air conditioning system powered by a dual voltage, 36Volt DC or 110VAC motor. It would switch automatically between power sources, just as our refrigerators do. All of these electric motors will be smaller in size and more efficient because of the increased operating voltage. Brake systems could move from hydraulic units to electrically operated units mounted at each wheel. These units would be integrated with the standard anti-lock braking systems and there would no longer be hydraulic lines running from front to back of our coaches. Braking systems could be optimized according to the load and weight distribution of a particular coach. Even the engine could undergo an electronic revolution. Engine valves could become electrically operated rather than operated by camshafts and cam followers or valve trains containing timing gears and chains. Under some operating conditions certain valves could be de-activated to turn off two or more cylinders or while braking, some valves could be closed to increase engine braking, somewhat like a "Pac-Brake" or "Jake brake" on a diesel powered coach. In fact, the need for these add-on systems would be eliminated. Engines could be optimized depending upon the application so that a motorhome engine control computer would be programmed differently than one that powers a stop-and-go city delivery or garbage truck. The reduction in mechanical systems could lead to lighter and potentially more efficient engines. Critical operating and diagnostic systems could be monitored not only from within the coach, but potentially via satellite link to a service facility in the event of a breakdown. If updated operating programs become available they could be loaded into the engine computer electronically, to bring the engine up to the latest standards. This new electrical system could also have dramatic changes in Coach power systems as well. We may see a movement away from separate Coach and Chassis battery systems. The ability to provide dual powered appliances will become a reality, so that all major appliances could operate on either 36VDC or 110VAC depending upon the power source available. Inverter systems could completely replace the AC electrical systems found on our Bounders. It is conceivable that Bounders could have a single electrical system that would accept dual powered appliances and inverters would supply 110VAC for small handheld appliances when required. Generators would charge the 36VDC batteries rather than supply the 110VAC. It is conceivable that a small gasoline or diesel powered motor could drive the new heavy-duty alternator on the coach that recharges all of the battery systems. Generators as we know them could become a thing of the past. Dream a little about the alternatives and watch the progress as these systems are introduced. Some of us remember when cars had 6-volt batteries that were difficult to start in cold weather. Many remember the introduction of the 12v alternator and electronic ignition. Who would want to go back to that era? Just imagine how much better our coaches will be when this new power systems hits the market in just 2 years. I, for one, can hardly wait.